Musician, painter and educator Natalia Zukerman grew up in New York City, studied art at Oberlin, started her mural business Off The Wall in San Francisco, began her songwriting career in Boston, and now resides, writes, plays, teaches and paints in Brooklyn, NY. Having released seven independent albums on Weasel Records and her own label Talisman Records, Zukerman has toured internationally as a solo performer since 2005. Her music can be heard on the soundtrack of several seasons of The L Word and ABC Family's Chasing Life. She also created the score for The Arch of Titus, an independent film created for Yeshiva University and a Harvard online course called Poetry in America. Throughout her career as a touring musician, she has accompanied and opened for some of acoustic music’s greats such as Janis Ian, Willy Porter, Susan Werner, Erin McKeown, Shawn Colvin, Ani DiFranco, Richard Thompson, Tom Paxton and many others. Alongside her touring career, Zukerman continues to paint private and public murals as well as illustrate children’s books, design and paint sets for plays in New York City and paint private portrait commissions. In February, 2017, Natalia became a Cultural Diplomat for the US Department of State, playing concerts and conducting workshops with her group The Northern Lights throughout Africa. Natalia teaches private songwriting lessons and has taught at Rocky Mountain Song School, Sisters Song School, Red Rocks Womens Music Festival, Winnipeg Folk Festival, Interlochen Summer Music Program and other festivals and locations throughout the US and in Canada. 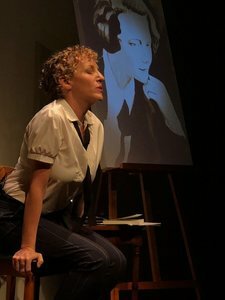 In May, she was the artist in residence at the cell theatre in New York City where she developed her multimedia one woman show, The Women Who Rode Away and is currently recording the soundtrack of the show and touring it throughout North America.